The following is a guest post from Aris Politopoulos, Universiteit Leiden, Archaeology. There is a huge amount of modern fiction out there set in Ancient Greece or based on Ancient Greek themes. Television series, books, video games, board games, comics, you name it. Due to its long history and mythology and the complexity of the characters, it offers great tools for creators to bring their ideas to life. Unfortunately what we usually end up with is overly produced movies etc. in which the background is a kitsch visualization with exaggerations and historical inaccuracies. Creators, trying to be precise in their depiction of the times, end up with more flaws than facts in what is, in the end, a weird mix of the modern conception of Ancient Greece with actual historical facts perceived wrongly. Zeus wants YOU to release the Kraken! Thankfully sometimes they also provide us with a lot of laughter due to their extreme errors. Who can forget for instance the scene in Xena where her best friend Gabrielle reads a prayer from a golden (?) papyrus with the words: efkaresto parapoli, etsi kai etsi, yasou kalimera yasou kalinihta yasou kalinoches (ευχαριστώ πάρα πολύ, έτσι κι έτσι, γεια σου καλημέρα, γεια σου καλυνύχτα γειά σου καλινότσες (?)) which is directly translated as: thank you very much, so and so, hello good morning, hello good night, hello good noches! Doesn’t sound much like a proper text does it? Or the recent blockbuster, Clash of the Titans, with gods in full plate armor and Godzilla making a cameo appearance as the Kracken (first image). Not to mention older movies like Jason and the Argonauts (a bloody $30 million 3 hour TV movie), Hercules (1983) and newer like Troy (2004) and Cyclopes (2008). One has to agree that these kinds of movies, or other forms of pop culture and entertainment that are based on ancient Greek mythology provide a good deal of laughter to the slightly informed audience. It makes you wonder though, why can’t they just make a proper movie or game based on ancient Greece, without it being extremely kitsch, funny or completely wrong. There is a certain argument that people tend to complain too much about historical inaccuracies while these kind of movies or games are simply based on ancient Greek mythology and they do not try to copy historical and/or mythological events. The problem however is not located in the mistakes but in the actual production and environment of these mediums. In movies like Troy for instance, it is sensible to expect a certain level of accuracy in the representation of the environment because they try to persuade the audience that they represent the ancient environment. Having gotten all this rant out of my system, I was a bit disturbed when I heard that the next expansion of my favorite card game, Magic the Gathering (MTG from now on), would be ancient Greek themed. What if it would be as bad as other experiences with games based on ancient Greece? What if it will be like God of War 2 and 3?! I decided to trust the development team however since they have managed to thrive in mythological themed expansions in the past like the Kamigawa block (based on Japanese mythology). When the first art and spoilers started I wasn’t disappointed. On the contrary, I was excited: a game with ancient Greek theme that looks good! The art, the names, the ideas, everything seems to be thoroughly investigated by the development team and properly introduced into the world of MTG. So why and how is this expansion so good? In the next part I will analyze some cards as examples to showcase how the developers of the game succeeded in creating a nice environment for the game and I will conclude on how ancient Greek mythology can be perceived and presented properly. Nylea, God of the Hunt: Nylea (fig. 3) is the goddess of the hunt, the wilderness, the seasons, metamorphosis and rebirth. She was mainly inspired by Artemis (Άρτεμις) in her multiple roles goddess of the hunt, protector of wild animals, wilderness, childbirth, protector of young girls and more. Similarly to Artemis, Nylea carries a bow and golden arrows. 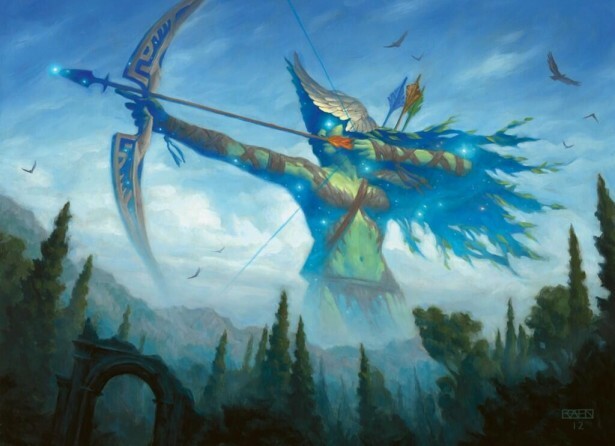 The Bow of Nylea card provides your creatures with the deathtouch ability, meaning that they can kill any opposing creatures by inflicting one point of damage. This is a very nice adaptation since Artemis’s bow would bring sudden death, like in the case of Artemis killing the children of Niobe. While similar, however, Nylea is not exactly the same as Artemis. She is also goddess of the four seasons and of the natural cycle, she despises agriculture, which she sees as an aberration to natural order. Additionally, there is a certain lack of temples in which Nylea is worshiped, as well as an absence of demand of sacrifices in her name. On the contrary, Artemis had several temples across Greece and sacrifices were made to calm her anger, which is one of her main characteristics. Purphoros, God of the Forge: Purphoros is the god of the forge, associated with fire, heat, energy, the restless earth, volcanoes, craftsmen, blacksmith, obsession and passion. The obvious equivalent in Greek mythology is Hephaestus (Ήφαιστος), also the god of blacksmith craftsmen, artisans, metals, metallurgy, fire and volcanoes. Purphoros carries a large hammer called Akmon, similar to representations of his Greek counterpart. A significant difference however is that Purphoros is portrayed as big and strong while Hephaestus was small and “shrivelled of foot”. Thassa, God of the Sea: Thassa (deriving from the word thalassa/θάλασσα: sea) is the goddess of the sea, of ancient knowledge, gradual change, murmurs, vast distances and long voyages. Thassa in an intriguing case because she combines two completely different gods from ancient Greece. On one hand there is the obvious counterpart of Poseidon, God of the Sea. He also carries a trident where Thassa carries a bident. Interestingly though, Thassa has attributes of Athena, God of Wisdom as well as ancient knowledge, vast distances, and she is associated with helping heroes in their quests. This combination is a bit provoking since Poseidon and Athena fought for the seat of the god-protector of Athens (spoiler: Athena won). The developers however managed to harmonically combine these two very different gods and the result doesn’t feel awkward at all. There are two more major gods in the pantheon, Heliod and Erebos and ten minor gods. While it would be interesting to examine the inspiration for each one, the above examples highlight the main thought process behind the creation of the Theros pantheon. Wizards of the Coast (WotC) and the developers of the game wanted to create a mythology which borrows but doesn’t copy attributes of the ancient Greek one. They created counterparts while avoiding direct imitation in each character. The choice of going with new names, which will be examined later, proves to be invaluable. Since people can relate thematically to the gods but they don’t have specific expectations of them meeting their standards (as one would have for example from a portrait of Zeus). 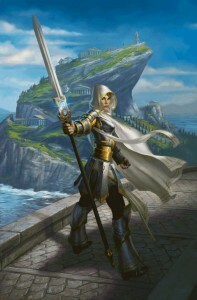 In order to create the plane of Theros, the developers wanted a diverse population in which they could represent the core characteristics of each in game color as well as the ancient Greek themes they wanted to use. For that reason, inspired by the different creatures which appear in Greek mythology they created different societies, cults, creatures and monsters. Among the creature types of Theros we see Cyclops, minotaurs, hydras, gorgons, nymphs, centaurs, satyrs, krakens, chimeras, golems, harpies and more. Once again we come across the same development planning. They used iconic figures of Greek mythology in order to create their own. Among the gorgon creatures for instance there is no Medusa, the most famous gorgon. Several gorgons however, with their abilities, represent Medusa. Their appearance is similar to representations of ancient Greek gorgons, with head covered in venomous snakes for hair and threatening look which can turn anyone who stares at it into stone. In contrast to the mythological creature, gorgons of Theros are willing to interact and ally with mortals. 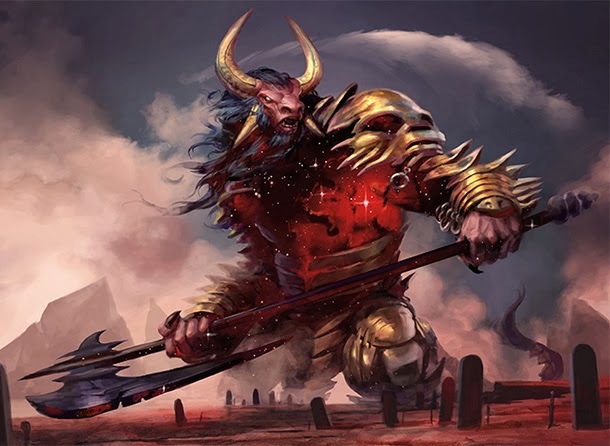 Similarly, minotaurs are portrayed as expected but they form societies. While savage, they are not uncivilized creatures chained in labyrinths. 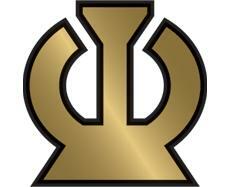 Their kind is represented among the pantheon with the lesser god Mogis (fig. 4) and they play a major role in the shaping of the plane. Centaurs also, while one will not find famous names like Chiron, Nessus and Eurytion, represent similar ideas. They are wise, life-giving, trainers, short tempered etc. The diverse population created by these different societies of creatures which interact with humans, with each other and with gods, forstered the development of a universe which is similar but doesn’t try to imitate the ancient Greek society. It makes good use of themes in a universe which also has its own characteristics, the multiverse of Magic the Gathering. Rescue from the Underworld: (fig. 5): Starting from the cards name we see a concept derived from Greek mythology. A good example is the story of Orpheus who traveled to the underworld to bring his love Eurydice back from the dead. The card is spot on in its rules because it demands that you sacrifice a creature as an additional cost to cast that spell. This sacrifice allows you, at the beginning of your next turn to bring the sacrificed creature as well as another creature from you graveyard (“the dead”) to the battlefield. It literally is a rescue from the underworld! Shipwreck Singer: Sirens are mythological creatures who charm sailors with their songs, driving them crazy. Homer’s story is well known, when Odysseus, curious as to what is their song, asked his shipmates to tie him to the mast while they put beeswax in their ears, so he could alone listen. In this card we have a creature which flies, just like the sirens and is associated with the Sirens of ancient Greece. One of her abilities is that she forces opposing creature to attack, just like Sirens forced sailors to listen to their songs and lose their minds. Additionally it has another ability which reduces the attack of all attacking creatures, again relating it to the state in which the sirens brought sailors. The flavor text coming with the cards describes it perfectly and again, makes the perfect connection with Greek mythology without mimicking: Her melody melds death and beauty with such artistry that even gods weep to hear it. Curse of the Swine: Again deriving from Homer’s Odyssey, this card represents another known story. Circe, a minor goddess of magic, lured Odysseus and his shipmates to dinner and by using magical potions transformed them to pigs. This card is a spell which allows the player to transform X creatures (depending on the amount of mana he pays) into boars. Once again the names are not mentioned and the flavor text connects perfectly to the story: Another imminent battle sunbsided in busy snuffling and carefree rooting. Most of the cards of the set have such counterparts in stories of ancient Greece or are flavorful. To mention a few more: Chained to the Rocks (from the story of Prometheus) (fig. 6); Akroan Horse (Trojan Horse); Triad of Fates (Moirai); Hundred-handed One (Hekatonheires) etc. 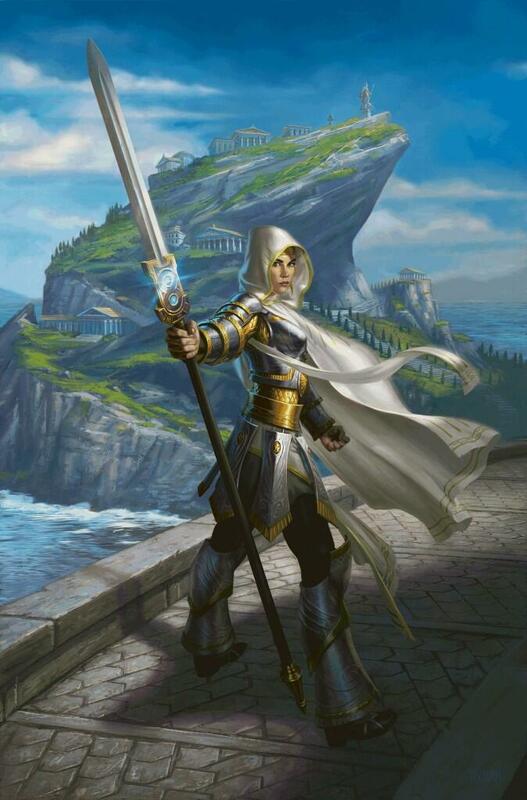 The last part of this overview deals with the names used in Theros. As previously mentioned the developers chose not to use names from the mythology but created their own. These names are either Greek or Greek-sounding. While this is the part which contains the only flaws or mistakes generally they have succeeded in creating spot on names. For example the world in which gods live is called Nyx, deriving from the Greek Νύξ which means night. Nyx is represented within the bodies of gods or inside temples where rituals take place as the night sky. The god Purphoros comes from Πυρφόρος, which literally means he who brings fire and is fitting for the god of the forge. Phenax, god of deceit, coming from the similar sounding Φέναξ, a word rarely used for wigs but also meaning cheating, deception and deliberate fraud. Some funny sounding or wrongly perceived words however are not absent and they are to be expected since there likely weren’t any native Greek speakers working for the development of the set. For example Tromokratis, a huge Kraken, is literally translated to terrorist. Iroas, a god worshiped in Akros, has a name which means hero (ήρωας). Therefore a card named Hero of Iroas would be translated into to Hero of Hero which sounds quite funny. Karametra, God of the Harvest is one of the funniest names for the native speakers since Karametros is a name used in modern Greek to describe the idiot or the fool. Concluding this post we observed an emerging pattern in the creation of the set. 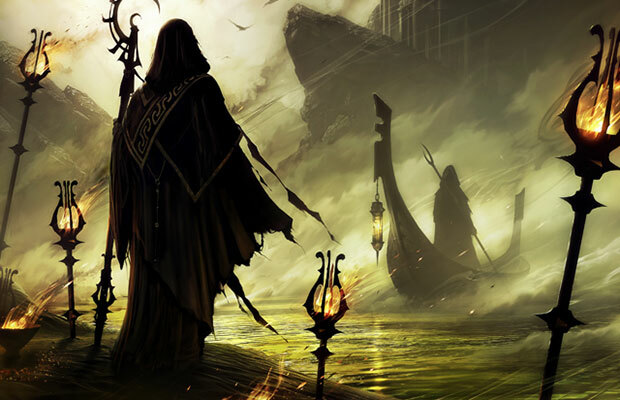 The developers created a dialectic relationship between mythology and the MTG universe. Themes are borrowed and adjusted from both sides: mythological themes are adjusted in the multiverse and themes from multiverse are adjusted in a mythological setting (fig. 7). This development process has created a setting which is familiar to the player both as a genuinely MTG set as well as an ancient Greek world. This happens because the setting doesn’t force the player to accept the view of specific mythological characters. It allows him to identify the themes with which he is familiar in a completely new environment which isn’t developed to persuade you that it a depiction of ancient Greece but simply an idea. In that respect it also succeeds in not being kitsch by not overemphasizing temples and other characteristic buildings of ancient Greece. The art is usually focused on the characters, be they humans or creatures, and the background just tried to grasp the general feeling, not specific monuments. Overall, WotC managed to create another great set for MTG, both as an environment as well as game/wise. If you are an old player it’s a good opportunity to make a comeback to the game. While it wasn’t possible to analyze every specific card with its mythological counterpart, I think I have showcased how the developers managed to create a nice ancient Greek themed game avoiding common, for the setting, traps. Theros is a universe which feels like ancient Greece but also stands on its own. The most important thing here is that it was clear from the beginning that the set wouldn’t try to imitate completely the past and that is the key difference with other productions about ancient Greece. Hopefully, in upcoming games or movies creators and artists will take notes and produce a better and more coherent depiction of ancient Greece and ancient Greek mythology. Even if I’m not a MTG player, I can appreciate your article. It’s certainly good news when artists use mythology in such creative ways. Interesting blog post, but what I find missing is a discussion of how the five colours of MtG have shaped the design of Theros. For instance, the number of 5 major + 10 minor gods results from the five colours and their 10 two-color combinations. Furthermore, I’d like to see an analysis of the poleis of Theros (Akros, Meletis, etc.) in terms of both historical accuracy and game design.